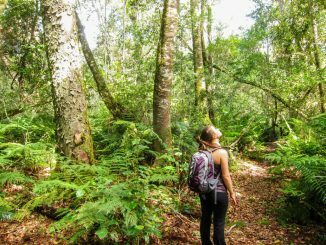 This spectacular trail through the ancient forests of Outeniqua, between George and Knysna on the Garden Route, can be done as a series of day walks or over a period of seven days. We started on what would technically be Day 3 of the seven-day trail, leaving from Platbos forest hut (where one would overnight at Day 2) and ending at Harkerville Hut, thus hiking five days of the full seven day trail. 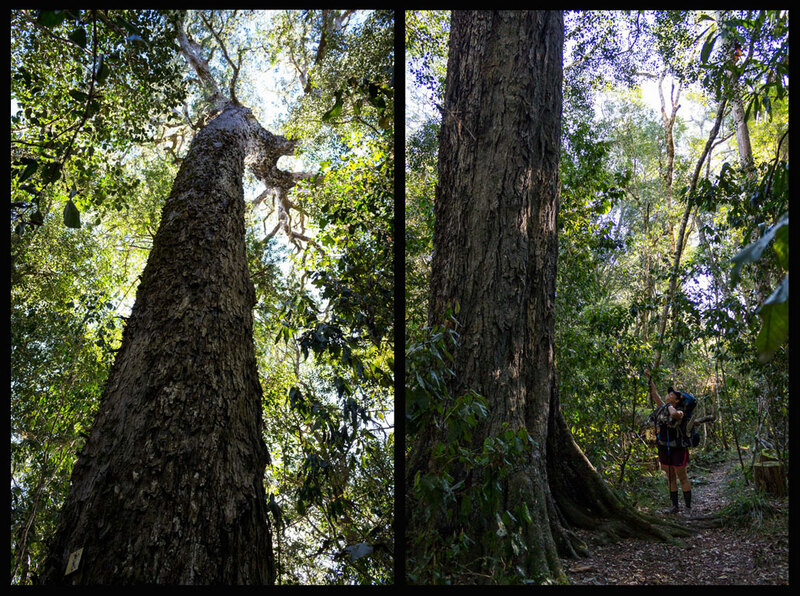 This first day of walking gave us a taste of what was to come – lush greenery that enveloped one, with only streaks of sunshine breaking through the forest canopy highlighting the gossamer strands of the spiderwebs that decorated the trunks and branches of the trees. 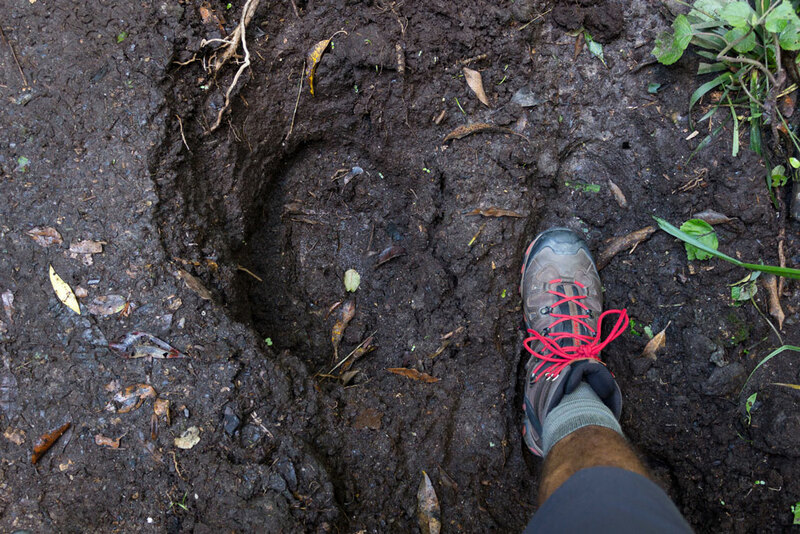 Within the first kilometer of leaving Platbos, we came across signs of elephant – a fresh heap of dung, and broken-off trees and branches lying in disarray across the path. We were stupid with excitement to have seen signs of these mysterious and elusive animals! Our first rest point was after a ‘hop-skip-and-jump’ river crossing, where the coffee in our cups matched the tannin-rich waters flowing past. As the shadows grew longer, we walked in awe through the decaying ruins held within Millwood area, lost for words at the history that the area is steeped in. We had expected the day to be around 15km’s; however, be warned that the last part of the day had a sting in the tail – a long, drawn-out uphill on jeep track that we estimated at approximately an additional 4km’s…We arrived at the hut in the dark, pretty worn out; but the braai facilities at the hut gave us a chance to off-load some of the extra weight we were carrying in the form of red wine and lamb chops! And the hot showers were a warm welcome to our aching feet. Our second day was marked by long ascents and steep descents. Although the majority of the trail is under cover of the trees, it was a challenging and hot day. 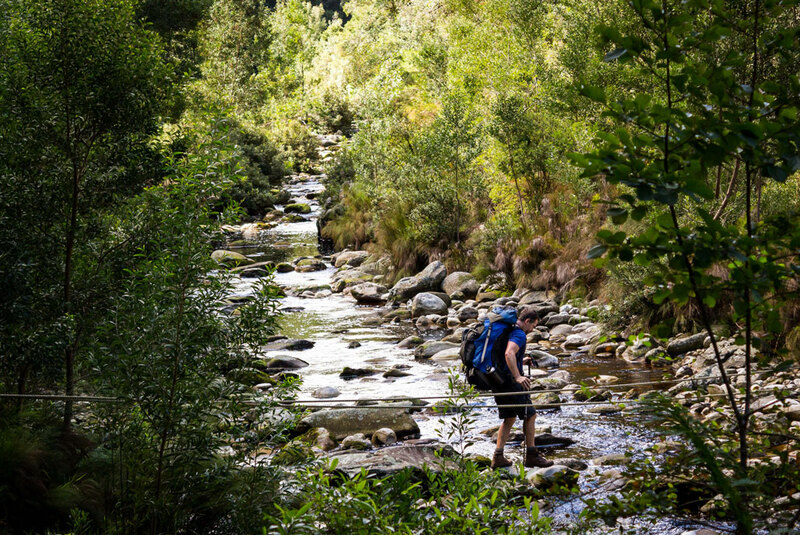 When we crossed the Knysna river at roughly the 9km mark, the icy water invited us in – and we spent a good hour alternatively munching lunch on the banks of the river and playing in the rushing stream. It was a welcome stop, because from there on, there was a long and steady uphill on a seemingly unending track before Rondebossie Hut appeared like a beacon through the trees. 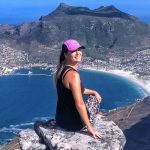 Here, pace separated the weak from the strong; I’m afraid to admit that this day nearly broke me – a heavy pack, light trail shoes and the undulating hills almost proved too much, and I pretty much crawled the last few kilometres. 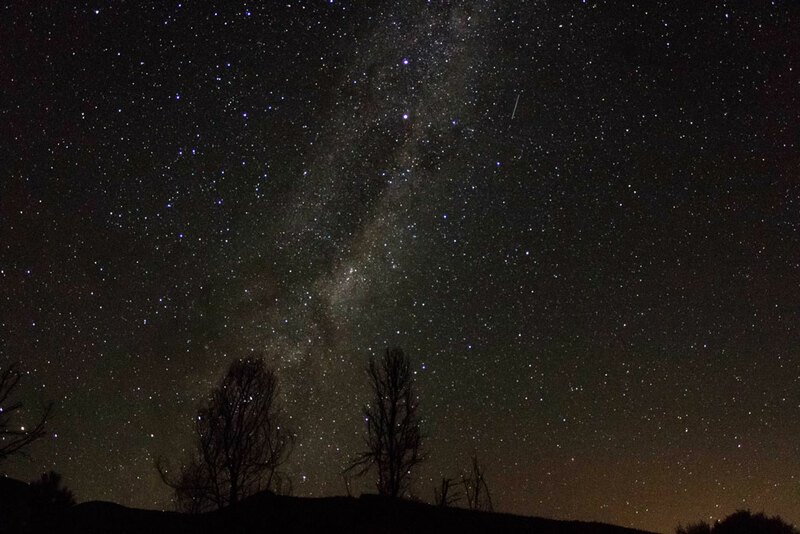 However, nothing that a cold shower, a sky of magnificent stars, and mampoer for dessert didn’t fix! A very tough day, but a beautiful day nonetheless. One of the shorter days of the Outeniqua Trail, I can highly recommend leaving as early as possible. 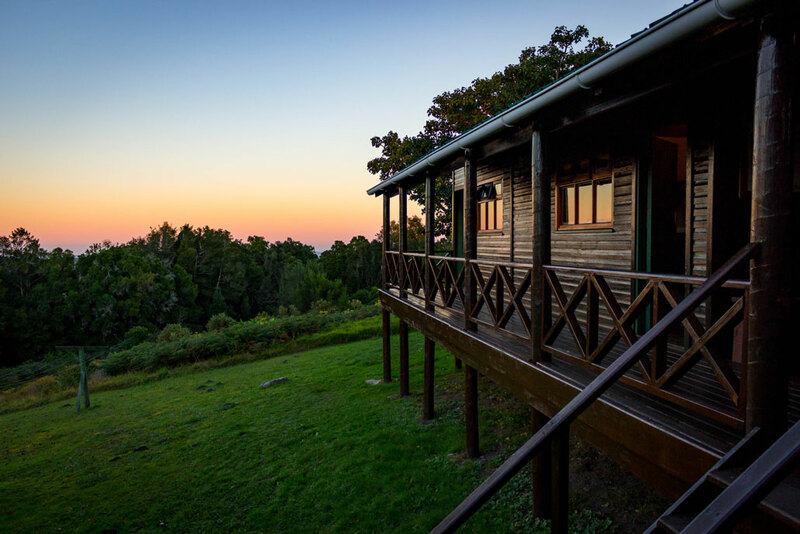 This is for numerous reasons: one being to see the early morning sun rays stream through the pine plantation that one encounters in the first few kilometres of walking. The second motivation would be to have the afternoon ‘off’ at Diepwalle hut, which (very conveniently) has a nearby restaurant, which (very miraculously) sells delicious, fresh and huge servings of Melktert, which (very coincidentally) our little troupe of six had been craving for the previous two days – but which closes mid-afternoon. 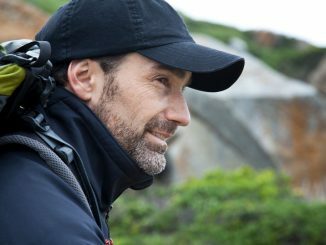 Thirdly, this is one of the days that hikers will be left speechless at the beauty that surrounds you, and one certainly needs the time to soak it all in without rushing on. 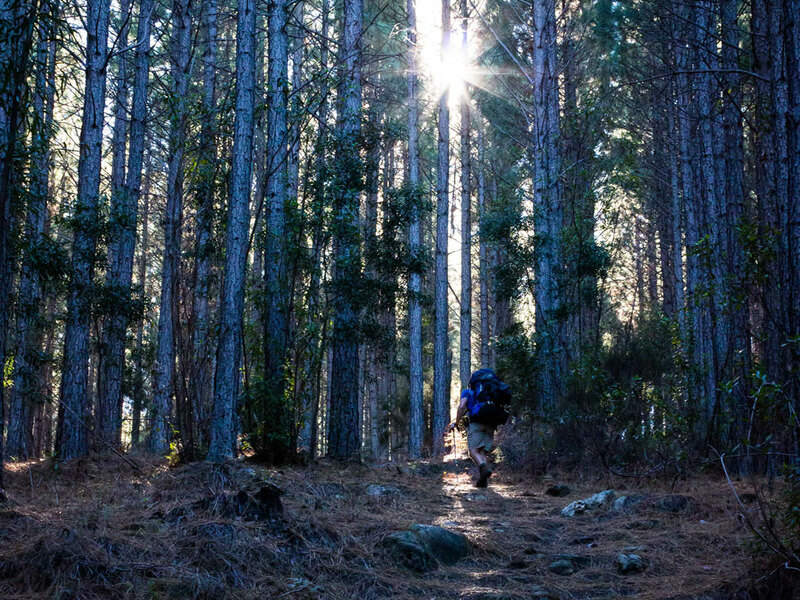 Dawn light steered us through the pine forest, to the top of Jonkersberg – one of the high points of the Outeniqua Trail. From the summit, we made our way down the ridge line at a brisk march to escape the midday sun, and entered into a fairy glen of thick, boreal forest. Moss-covered rocks lined the pathway, and twisted age-old indigenous trees dripped with lichen and ‘old-man’s beard’. Roots that followed us for several metres were cushioned by luminous cloaks of fungus, while gargantuan ferns umbrella-d over our heads. 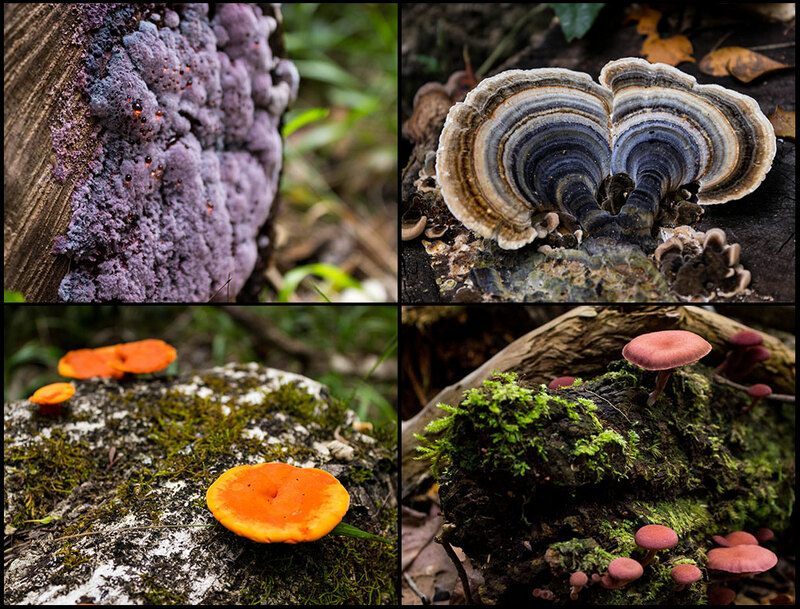 Our march halted and we gazed in silence at the Jurassic surrounds, struck by wonder at the ancient growth – and the weightiness of understanding what nature can achieve when left to her own devices. The afternoon continued with many somber pauses, and ended with melktert and quiet fireside chats. From an early start deep in the forest, the trail begun to cut across numerous tracks, paths and river streams as the day progressed. Although a relatively easy day, with few steep inclines and declines, the old legs begun to feel tired, and some of the crew had to take a few swigs of whipskey for ‘sterkte’ along the way 😉 We made every excuse to regroup, have long chats and boil up a quick cup of joe along the way, knowing it was our last long day of hiking; and with plenty of sheltered spots to stop, it was worthwhile taking it slow and breathing in the green, letting it fill up the soul. 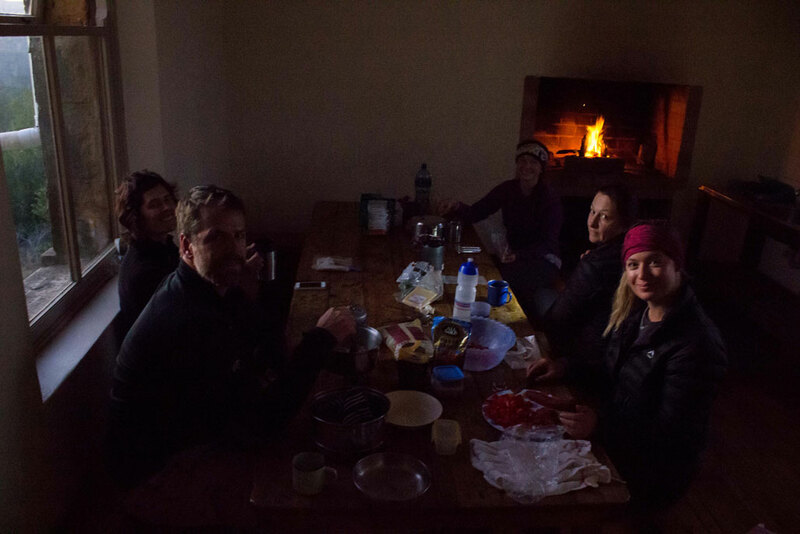 We reached Fisanthoek Hut with enough time to enjoy the last warm rays of the day, and enjoyed our last night together as a crew by making a huge pot of chorizo-infused, tomato pasta by headlamp and playing a competitive game of Penny Poephol! 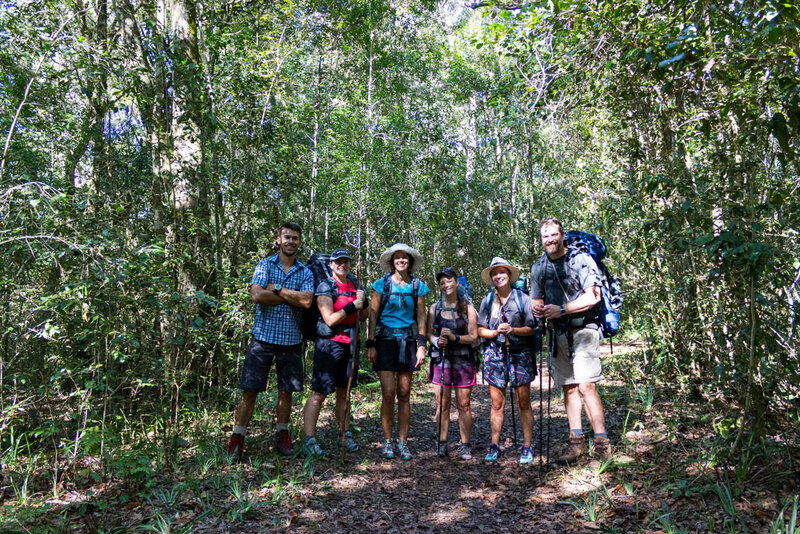 The last day of the trail, we took a gentle pace and spent most of the few hours left hiking within earshot and eye-sight of each other – a group of like-minded individuals who had grown close over the five-day period. After a few kilometres, the silence of the forest was broken by the escalating sounds of man as we came closer to civilization (namely, the N2). 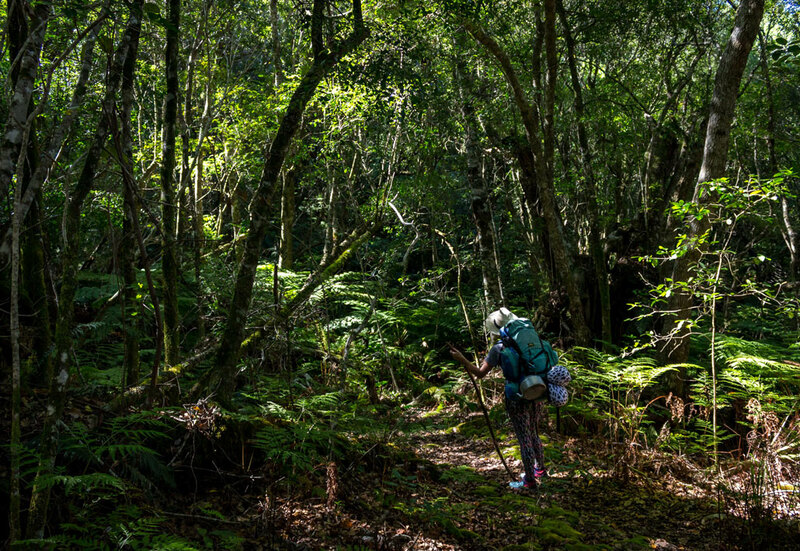 Fortunately, the last few kilometres of the Outeniqua Trail end in the thickets of the Harkerville forest and for a brief while after crossing the N2, we had the illusion of being entirely separate from the rat race once again. 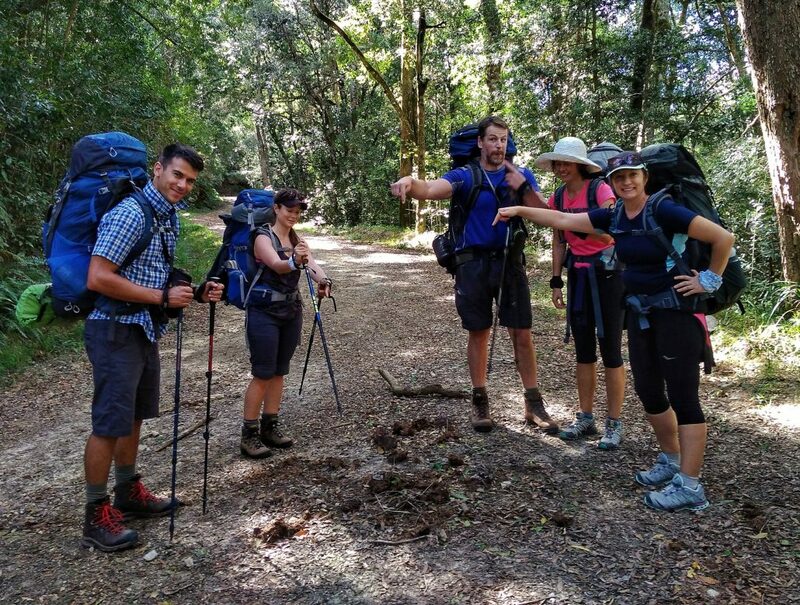 It was here, just a few km’s short of finishing the Outeniqua Trail, that we were blessed with the rare sighting of not one, nor two, but several Knysna Loeries in flight – their crimson tipped wings flashing overhead as they seemed to chase and dance with one another in the joy of flight. 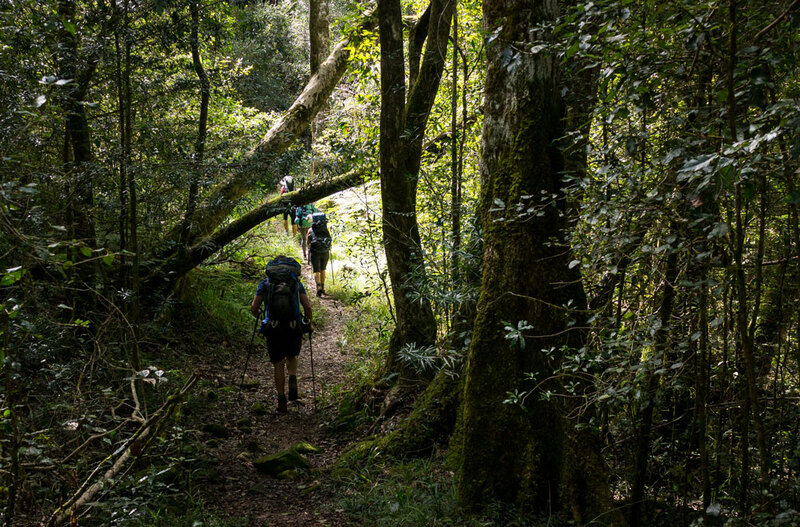 And thus spellbound, we walked out at Harkerville Hut still marveling in wonder and in awe at the magical few days spent deep in the ancient forests of the Outeniqua Trail! 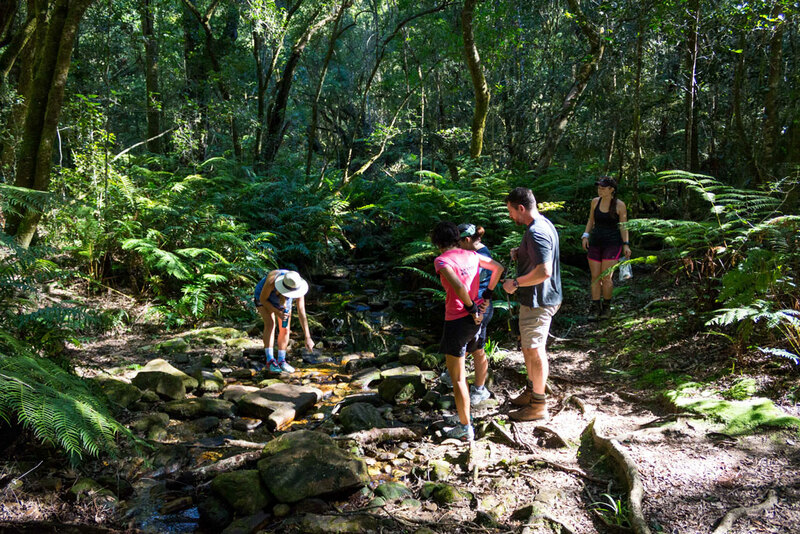 The Outeniqua Trail is a absolute gem and worth every bit of effort. It is an amazing privilege to be able to walk through such pristine forest. 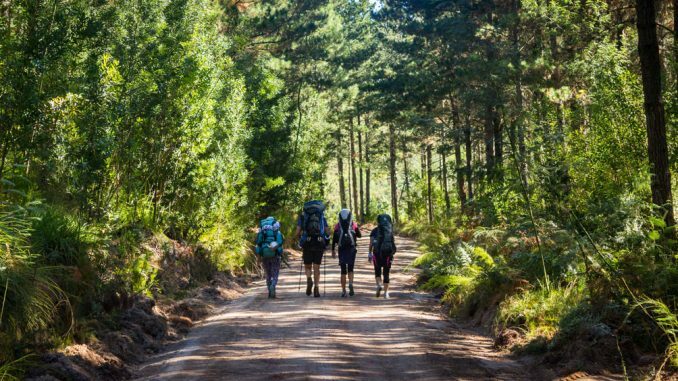 This is a must-do trail for anyone who enjoys multi-day hikes, but be warned, there are some long days and steep hills. Technical rating of trail: Contains short sections of very steep inclines and minor river crossings. A very useful article. thank you! this article gives a very good overview of the trail and insider info in terms of what to expect. keep these articles coming! This is such a lovely article! Such an awesome write up Dania Petrik. I’m definitely putting this on my list! Has the route been affected by any of the recent fires? Fortunately not. The old forest was untouched. Apparently 1st part of trail closed, but rodebossie to hakerville open, not sure if this means you must sart at at rodebossie or you start at mill Wood to make Rondebossie your first night? Actually, Harkerville is closed except for a single day trail. Found this out two weeks ago when we wanted to do a circuit (one day trail is open). But I have done the unthinkable and parked at Farleigh, done the 3 day circuit in reverse in 2 days (Farleigh>Karatara>Windmeulnek>Farleigh). Windmeulnek was spectacular!!! The trail up from Karatara has far better views than the official day 1, but its a climb. You do the ascent in 1/4 of the distance than the normal day 1. Noted the old trail is just that…old and unused…I think the SANParks guys was completely shocked (had to ask them because it isn’t sign posted). 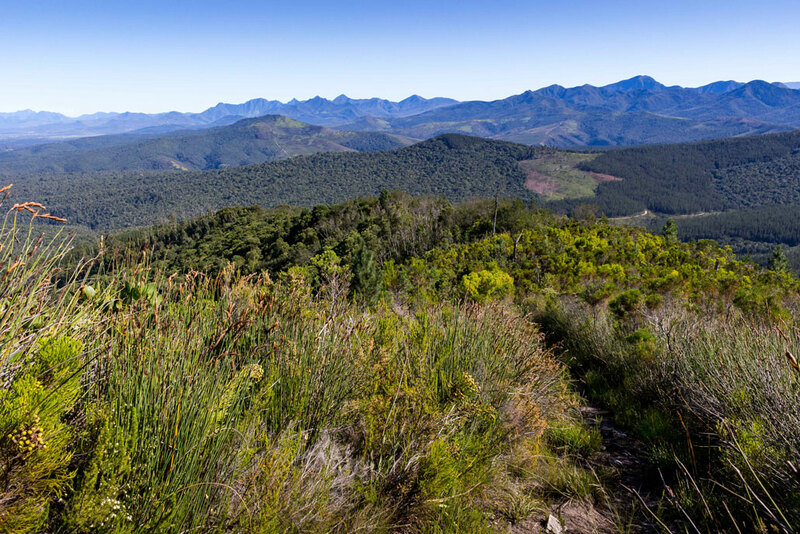 I still want to do the old Outeniqua where you start around the other side of the mountain (the trail is still there). Also, the trail between windmeulnek and farleigh was in really bad shape in March 2018 so I am hoping they fixed it up. Oh and Diepwalle was also closed this month (nov 2018) not sure when it will open the hikes. 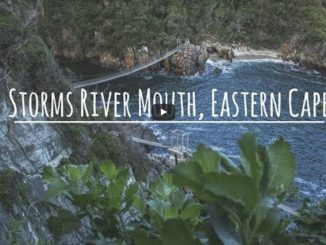 I hiked this hike many years ago and remember on one day leaving a hut, hiking straight up to the op of the mountain range and then straight down into the forest full of beautiful tree ferns. Now I would like my family to experience this. However we are not fit enough to do the full 7 days so would like to do the 2 days. Can you advise which days are the most beautiful and in the forest?